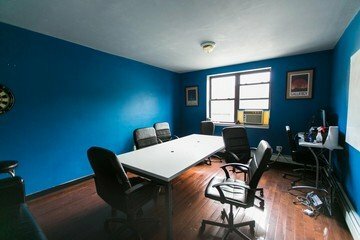 This cool blue and casual conference room in New York is sure to give your meeting a directed yet relaxed vibe. The simply styled room is located in a coworking office in Williamsburg and has an active collaborative community right outside the meeting room door. If you rent this pleasant conference room in NYC, your hire will come equipped with a cultivated, professional environment to make your meeting a surefire success. Finding a spot in NYC with a qualified working environment is rare; sometimes, you aren’t sure what exactly you’ll get in New York. Luckily, this conference room in Williamsburg is clean and distinct and includes all of the organization and professionalism of an entire office. The atmosphere is cool but concentrated and is perfect for start-ups, small businesses, freelancers and artists who are looking for a suitable space for an official meeting, conference or brainstorm. The cheerful conference room for hire can fit up to 6 people and is always equipped with a whiteboard, projector and screen, TV screen, and music system for your meeting’s technical needs. A flipchart can be made available for your meeting and can be added to the rental for a small fee. Water, coffee and tea are also provided free of charge with the space rental and if you need lunch, it can be ordered in and added to your rental for an extra charge. 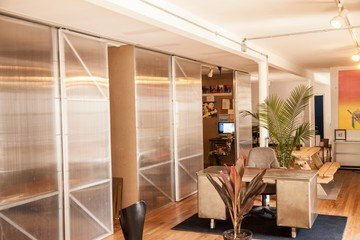 This NYC conference room has a phenomenal location in Williamsburg. The coworking space is conveniently close to both the L and G train and is just a five minute ride from Lower Manhattan. There are many restaurants in the area as well as a few bars you can check out. If your colleagues are traveling to meet you, they can find a few hotels close by, including the City View hotel. The charming neighborhood is a mix of residential and commercial with an artistic flair and a budding population and it is sure to impress your colleagues.